It’s time for more tulips – well, a single tulip in this case. This card was created by Debbi. 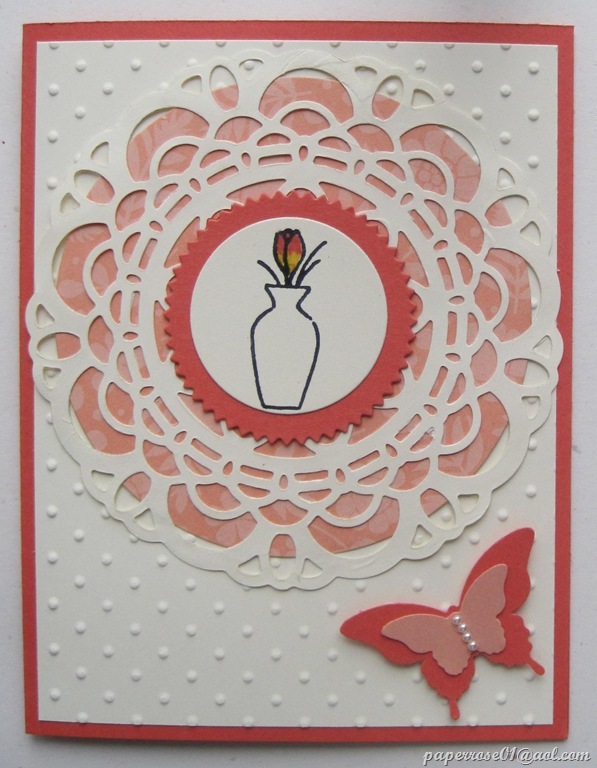 This elegant Calypso Coral card features a single vased tulip from the Vivid Vases stamp. The Perfect Polka Dots Embossing Folder gives the Very Vanilla cs a nice background texture. The pre-cut Paper Doily Sizzlits Die provides great detail and is well defined with the Sweet Sorbet DSP backing. Actually, I had pre-cut the Very anilla doilies several years ago when I ended up in the hospital for one of my knee surgeries and had to cancel a Stamp Camp. Debbi used a Calypso Coral Starburst Framelits circle to highlight the tulip vase which is stamped and colored with markers. The Elegant and Bitty Butterfly punches are used with Calypso Coral and Crisp Cantaloupe cs to form a double butterfly with pearls. We use these two butterfly punches on so many of our spring and summer cards. My hubby just reminded me to mention that I have replenished my Tombo Mono Adhesive refill supply. I was forced to find a new supplier, but am able to hold the price of $2.00 per refill or $12.00 per box of 6. You have now seen all cards except one – the Easter Swing card. This final card will be posted later today, so check back this evening! Hope you can make it to our April Stamp Camp on April 3, 4, and 5. Give me a call or send me an E-mail if you have any questions.